This Monday's speaker is Brenda M. Miller, a self-professed sewing junky, who is the designer of the Among Brenda’s Quilts & Bags pattern line. Working closely with Hoffman California Fabrics, she is widely known for her functional and exquisitely made bags. Attention to detail and Brenda’s ‘no raw edge ’philosophy results in a professional and custom made look. 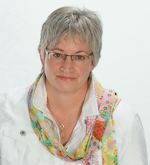 Brenda has been teaching, designing and lecturing since 2005 and is a Baby Lock Ambassador in Canada. Brenda's presentation will be “Developing the Designer in You.”Using her design journey as an example, with all its pitfalls and successes, Brenda will suggest ways to become aware of our own creative possibilities. Brenda will share some of her own creations and some inherited quilts that inspired her. Brenda's patterns will also be available for sale at the break. Learn more about Brenda at www.amongbrendasquilts.com. Show & Tell is back on this month, so we are looking forward to catching up with all your projects! Please remember that only projects that are brought for display downstairs before the meeting can be photographed. Bring your own mug for coffee or tea downstairs at the break.